If you had read my previous review of Grizzly’s G0715P hybrid saw that I received week before last, you know that I had a serious unsafe issue with it, and I received permission from Grizzly to return it. It’s been reboxed, and will be picked up by UPS freight Tuesday. I was leery of getting the same saw again, so I went ahead and ordered a new G0690 cabinet saw, which is what I was considering ordering in the first place. I just wasn’t sure if the $500 price difference was worth it. I went out on a limb ordering the G0690 before being reimbursed for the G0715P. It has to be inspected upon receipt to verify the problem, and I wasn’t sure how long that would take. The G0690 came within two days of ordering it, but St. Louis is only 200 miles up I-44 from Springfield’s warehouse. The saw is about 100 lbs heavier than the G0715P so I removed the top before taking the base unit to my basement workshop. I was very pleased to see that the top had a much nicer milled surface compared to the G0715P. You could see somewhat of a reflection when observed at a low angle. I put the saw in my HTF mobile base. The tape on the saw’s base (not painted as I had thought) kept getting hung up on the exposed bolts of the base, so I removed the tape. Grizzly needs to spend an extra few bucks, and have a painted base, not tape. I was really disappointed when I unpacked the extension wings. They were not nearly as nicely milled, and maybe weren’t as good in grinding quality as the G0715P wings. So I had a very nice looking, almost shiny table surface, and two dull and actually rough extension wings. I spent a little time and some elbow grease using T-9 lubricant and 1000 grit wet/dry sandpaper, and they’re much better. They’re about as smooth to the touch as the table surface, but not quite as shiny. Close, but not quite. There are some discrepancies, but not more than .004”, across the entire top surface using my 5’ straightedge and feeler gauges. I doubt that will have much effect on woodcutting, though. The black extension table is a little swayback in the middle, but that’s better than having it high in the middle. Grizzly should have a center through bolt connecting it to the cast iron extension wing for a height adjustment. I don’t have the power switch mounted, as per the photo, because Grizzly needs to send the two missing mounting screws and washers. The saw went together pretty easily, especially since I had practice assembling the G0715P first. The overall fit and finish, except for the extension wings, is excellent. I need to tinker with it a little more, but I can’t get the clear panels of the blade guard to set flat on the table surface. They’re about a 1/4” off the surface at the front. Maybe they’re supposed to be that way; however, the G0715P’s blade guard set flat. One nice feature is the nylon filaments that cover the curved opening of the blade height control wheel. Nice touch. Since I had removed the table top, I had to set the miter gauge parallel to the blade. What a breeze that was compared to the G0715P with the trunnions mounted to the underside of the table top. I’m glad I had removed the top because it made it quite easy to remove all the cosmoline that was gobbed all around the trunnions and gears, and to coat on white grease. With the top on there’s no way to have seen all the cosmoline because the top would have hid it. 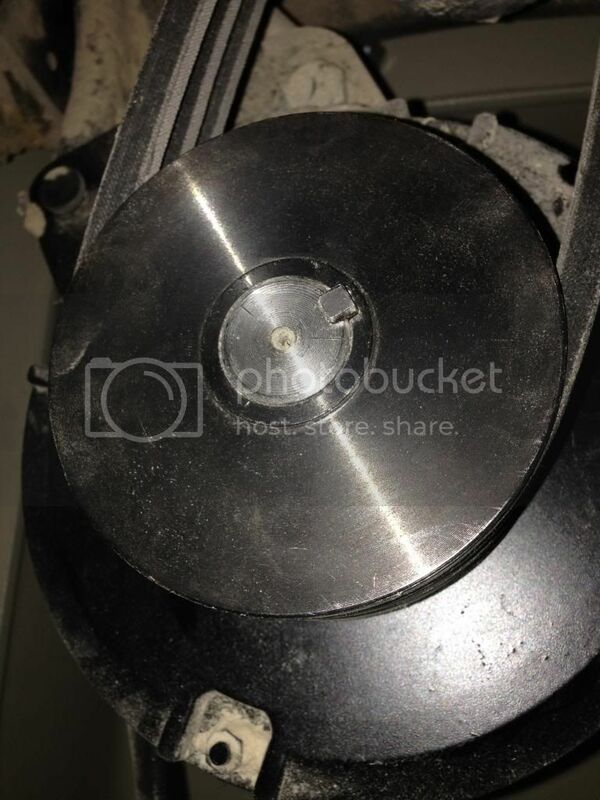 Using my TS Aligner, Jr. and dial indicator, the blade was .003” off from being perpendicular to the table top. Some tinkering with the stop bolt corrected the problem. The blade was also off .003” at the 45 degree position; however, I have yet to find the stop bolt, even trying to go by the picture in the manual. That will have to wait for now. I also had to do some adjusting of the fence to get it parallel to the blade. I actually have it set to toe out from the blade about .002”, just to be safe from any possible kickback. I won’t be installing Grizzly’s tape rule as I found it to be off-measurement slightly compared to my steel rule. I will go to Woodcraft, and get their Starrett tape. The saw is definitely more quiet than the G0715P. I put some weatherstripping around the motor cover, which probably helped a little. So is the saw worth $500 more than the G0715P? I’d say ‘yes’ if the extension wings were the same quality grind as the table surface. I’ll know better after I’ve used the saw for awhile compared to my previous 15-year old Jet contractor saw. All-in-all, though, I’d say the G0690 is a bargain at $1400 with shipping compared to, say, Jet or Powermatic. Delta’s Unisaw and Sawstop are in a different league, and can’t be used for comparison. Nice review. Hate that you had to go through that. Hope the new one works like a champ. I was tempted by GO715 price tag but will in all likely hood get GO 690.Thanks for confirming my original plan. I don’t think you will be disappointed. I called Grizzly this morning to advise them of the missing screws/washers for mounting the power switch. I brought up the disappointing quality of the extension wings, and was told they should have been of the same grind quality as the table top. He was willing to ship new ones to me, but I declined since I have these pretty acceptable now. One more very nice difference (I believe) between the two saws that I forgot to mention is that it takes three times the revolution of the G0715P height adjustment wheel to fully raise the blade as the G0690. The G0690 really goes up/down fast! Now I know what to expect in the morning. My G0690 is due to land here and get a 5 1/2 inch lowering. Congrats on the new saw. Glad to see you got the G0690….you will like it alot better then the Hybrids or contractors types for sure. I have been using my G0691 for a couple of years now and it has done everything I have thrown at it….and was pretty tight out of the box. Funny that your extension wings were different…mine are shiny and the same as the table (the G0691 is the G0690 but with longer rails). I guess they may have changed them in the last two years? My saw came lathered in shipping grease (cosmoline or what have you) – probably to protect it from the salt air while it travels from China. All the inventory was intact and the shipping box was pretty heavy duty as I remember. The saw took only a few tweaks of the angle settings….the run out was under tolerance and the fence only needed minor tweaking to make it parallel. I put on my WWII blade and started cutting away the very afternoon the saw came….I have thrown some hard woods at it….lignum vitae…ironwood….and it handled them without even slowing down….gotta love that 3hp Leeson. Even though the wings are greatly improved, maybe I should consider calling Grizzly, since you say yours were the same quality grind as the table top, reggiek, to see about a swap. What do you think? I purchased a Starrett adhesive tape at my local Woodcraft store yesterday, and it is spot on accurate compared with my 18” steel rule. I really caution anyone who is purchasing any of Grizzly’s saws to check their tape against a steel rule. It wouldn’t be a problem if Grizzly’s rule was somewhat stretched because you could always shave a bit off your workpiece to get an accurate measurement. However, their rule has shrunk, so if you want to take a 12” cut, you’re going to end up with slightly less than 12”. I found that 18” on my steel rule was actually 1/32” shy of 18” on Grizzly’s tape. Alpiner, why not ask for the wings to be replaced? If they are an inconvenience….All they could say is no….but I bet you will be surprised by their customer support. As for using a steel rule….I always use one when I am looking for accurate cuts – especially on tight fitting joints….the rules on saws, fences, router tables..etc…etc….require that they are adjusted everytime something is moved or changed – where a steel ruler works right out of the gate….I use the tapes on equipment as a way to provide a little confirmation that the cut length is around where it should be….but not for precision. Actually, I did contact them this morning, and they’ll be shipping the replacement wings to me. Grizzly has always been extremely accommodating to me. My concern is that the new ones will be like the old ones, but I’m willing to take a chance. They said they didn’t want the other ones back, even though they’re perfectly fine especially after I dressed them with 1000 grit sandpaper. I have no use for them. It will be a shame to just trash them. Regarding the table saw fence tape or steel rule, I was spoiled with my old Jet contractor saw as the tape scale was extremely exact. I put on the new Starrett tape this morning, and it’s set precisely on the new G0690’s fence tubing according to my digital caliper. Alpiner, Congrats on your new saw. I put the Starrett tape on my T2 fence when I mounted it to my table saw, and it is a very accurate scale. I stretched my old fence tape trying to remove it and mount it on the T2. Congrats on the new saw and thank you for the evaluation! I’ve been exploring a new TS and am torn on what to buy with a small budget. Was really tempted to go with the GO715P but couldn’t find where they cut $500 worth of corners. Guess I’ll follow your lead and go with the G0960. I’ll have to have 220 run into my small shop which was another reason I was looking at 2hp vs 3hp. Any thoughts on the Shop Fox mobile base Grizzly has on sale with the TS? You need to go with the HTC3000 mobile base that’s now available at Woodcraft for $70. That’s what I have, and it holds the saw’s weight very well. Many reviews have an unfavorable rating for the Shop Fox base. Since I’ve had both the G0715P and the G0690, I now believe it is worth the additional $500 for the G0690, which is now on sale for $1250. I’ve worked with my G0690 for about three months now using it on a couple of projects, one cutting 3” maple. It is a terrific saw. I have noticed one thing that puzzles me, and this applies to any table saw really. I’m picking up very fine cross grain surface scratches, and I don’t know where they’re coming from as I never have anything but wood on the table. The only thing I can figure out is perhaps the knots are scratching it as I move a board into position to cut it. Any thoughts? Relatively new here. Tried to post this before but somehow failed. I have the 690 and am extremely happy with it. But after about 2 years, the “key” that keeps the pulley that turns the blade attached to the motor shaft has come out. The “key” is the little metal square between the shaft and the pulley in the picture. apparently there is some sort of set screw that keeps everything in in place, which I suspect worked its way out. Does anyone with a 690 know where this set screw goes? I honestly do not know, g_uncle. My only suggestion is to contact Grizzly’s tech support. Perhaps you can post your solution, once determined, so we can all benefit from it.